In separate essays, Nathan Emmerich and Igor Gontcharov argue for more flexible systems that would avoid imposing biomedical ethics on the social sciences. Emmerich calls for an emphasis on professional ethics, while Gontcharov seeks “a set of ethical principles that would better reflect the position of [social sciences and humanities] researchers and participants.” I am left unsure what either proposed reform would look like in practice. the social sciences can lay claim to a democratic ideal as its ‘higher good’ and, therefore, its guiding ethos or end… . Given this end – democracy – social science research is persuaded not for its own sake or for the sake of knowledge in itself. Rather, its pursuit is rooted in the (admittedly diverse) socio-political needs of ‘democracy,’ understood as an ethos or normative as an end in itself. forums healthcare professionals can attend in order to discuss any ethical issues they encounter. Committee members are usually healthcare professionals but may also include lawyers, theologians, (bio)ethicists, and patient representatives or lay persons. Debates are relatively informal and if a committee offers a collective opinion – which is not always the case – decisions regarding any action remain the responsibility of those professionals directly involved in the case. CECs therefore provide a forum for debate and, as such, a means to improve the quality of ethical reflection in practice. justify the ethical aspects of their proposal with reference to the specific disciplinary norms that guide their work as professionals. The subsequent discussion would, of course, offer critique or raise additional issues as necessary. Such committees could, if they saw fit or if it were considered helpful to do so, produce a written comments or recommendations but, in so far as they are justified in doing so, the individual researcher could proceed within the boundaries of their own professional ethics. I’ve long thought that making ethics review voluntary could force ethics committees to improve the quality of their recommendations. As it stands, committees can use threats to impose their will, so they need not persuade researchers of the value of their suggestions. If stripped of this power, they would need to make suggestions good and clear enough to inspire voluntary compliance. But I’m less sure that such a switch requires or merits the wholesale reframing from research ethics to professional ethics. If your profession is research, aren’t research ethics a form of professional ethics? I also wonder about Emmerich’s comparison of social science to “the true professions of law, medicine, [and] the clergy.” It strikes me that a key characteristic of these professions is the ability (in theory) of fellow professionals to disbar, debar, or defrock. Social scientists do not have such power. 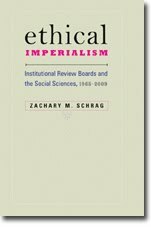 In my essay, “Ethical Pluralism,” in The Ethics Rupture: Exploring Alternatives to Formal Research-Ethics Review, Will C. van den Hoonaard and Ann Hamilton, eds., (University of Toronto Press, 2016), I concluded that greater trust in the scholarly professions would likely require less reliance on threats. Does Emmerich agree? Although initial research questions may be outlined in the formalized research proposal, REBs should be aware that it is quite common for specific questions (as well as shifts in data sources or discovery of data sources) to emerge only during the research project. Due to the inductive nature of qualitative research and the emergent design approach of the research, some of these elements may evolve as the project progresses. (Article 10.5). Written consent forms are a feature of REB oversight, which has a demoralizing effect on researchers, since they realize that they can only pass ethics by accommodating the elements that are native to research ethics boards, but potentially foreign to their projects. REB professionals rely on a hierarchically-structured concept of power, power as dominance, assuming that researchers have power over their human participants. On the other hand, participatory researchers do not operate from within this “power over” perspective, since the context presupposes a more nuanced, multidimensional understanding of power, in which even the very distinction between researches and participants may be blurred or even irrelevant. To be sure, as Nancy Janovicek has written, not all REBs are following the guidance in the revised TCPS. But I am baffled by Gontcharov’s attack on a document that already includes key distinctions between biomedical and qualitative research that he wishes to highlight. Well, yes! As you and Stark (and Hedgcoe’s latest) show, for various reasons biomedical research ethics was deliberately created as something independent of the existing structures of biomedical professional ethics. Given the methodological and epistemic commitments in the biomedical (natural) sciences this was tenable. Part of the reason it has proved problematic in the social sciences is because this is not the case in these disciplines. Like medical practice, the social sciences are both science and art! Rethinking research ethics as a professional ethics does not necessitate a wholesale rejection of the former in favour of some wholly original creation in terms of the latter. Rather it requires the ethical terms of research to be restated and their meaning, purpose and logic to be reconsidered. You also question whether we can (or should) expect the social sciences to become institutionalised in the same way as medicine, law, the clergy (or the military). And if this will compromise a necessary ethical pluralism. First, i don’t think it is possible or desirable to institutionalise in this way - having a professional body to credentialise and disbar or defrock social scientists doesn’t seem likely or a good idea! There are too many sub-specialisms and we lack the requisite overarching unity. I’d rather see existing professional bodies articulate standards of professional research ethics and have research (and RECs) make actual use of them. Trust in social science is important, but at this point what is vital is that distrust is not allowed to take hold. Regardless of fault, the case of the Boston College Project and in the example of Marie-Ève Maillé show current promises of confidentiality are highly suspect. This needs to be addressed sooner rather than later, and preferable at a collective level.